By the numbers, HP Inc., Alliance Resource Partners, and General Motors all look pretty cheap. Should you actually invest in these companies, though? There is plenty of talk that stocks are near or at all time highs as of late and that there aren't any good deals right now. However, investors that want to do a little digging will find quite a few interesting stocks that look very cheap. The thing that makes some of them cheap, though, is that they are in unique positions such as being in industries that are in structural decline or are simply in cyclical markets. Three dividend paying stocks that look very cheap by traditional valuation metrics today are HP Inc. (NYSE:HPQ), Alliance Resource Partners (NASDAQ:ARLP), and General Motors (NYSE:GM). Let's take a quick look at why these shares are cheap and whether they are worth an investment today or not. Can a company's strengths overcome a declining industry? Looking purely at the numbers, HP Inc. looks to be an incredibly cheap stock. Its dividend yield is a pretty robust 3.2% and its price to trailing to 12 month earnings is just 7.5. It's no wonder with a cheap stock price like this that management is buying back loads of stock over the past year or so. 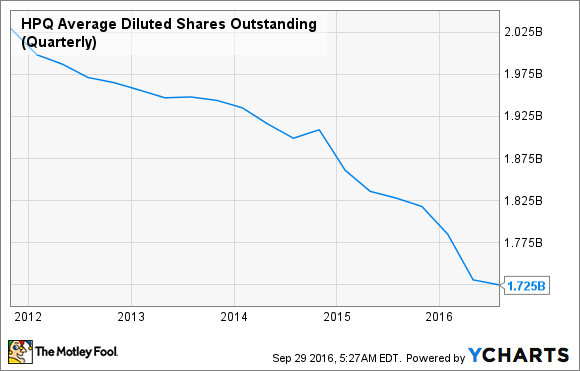 HPQ Average Diluted Shares Outstanding (Quarterly) data by YCharts. As you look deeper into the situation, though, there are some mixed signals that might make investors think that this stock may be cheap for a reason. One thing to keep in mind is that the company completed its split into HP Inc. and Hewlett-Packard Enterprise (NYSE:HPE), and former CEO Meg Whitman decided to go with the newly formed business rather than hang onto the legacy business. There is also the tricky situation where the two big markets for HP Inc. -- PCs and printers -- have been and will likely continue to decline as mobile devices become even more ubiquitous. On the flip side, there are some small signs of hope for HP Inc. The company is actually gaining market share in the PC industry as it focuses on higher end PCs designed for high performance tasks such as gaming. This is a portion of the PC industry that remains more robust and typically commands a higher price point. The company is also improving its cost structure, as it has reduced its overhead costs by $3.2 billion in the first nine months of 2016. It looks as though things could go either way right now. Either the company could end up succumbing to industry headwinds over time, or it could get a toehold with these strategic decisions that could help drive sales. The stock may be cheap, but it's probably worth watching this one for a few more quarters to see how this industry versus strategy dynamic plays out. Like the PC industry, coal consumption across the U.S. is in structural decline. Cheap natural gas is taking market share from coal very fast, and wind and solar energy costs are dropping fast enough that new power generation is going to look at these options before coal. Like HP, though, Alliance Resource Partners has been bucking industry trends for a while and gaining market share. Its coal mines in the Illinois Basin have much lower costs than the traditional coal mining centers in the U.S. such as Central Appalachia. It also helps that the company kept its head down and focused on its own operations rather than blowing up its balance sheet like so many other coal miners did in 2011 to make acquisitions at the top of the cycle. The company did recently trim its payout to shareholders as the market for coal has been so brutal, but the wave of bankruptcies in the industry is leading to a more stable coal market. With a still very large installed base of coal plants in the U.S. generating power there is still a decent opportunity for Alliance to grow as it gains even more market share and ride the last waves of coal as a power source in the U.S.
Clearly, Alliance isn't a buy and hold forever kind of investment because of the industry's decline, but today's stock -- trading at an enterprise value to EBITDA of just 4.1 times and a distribution yield of 7.8% -- has a bit of value that can still be squeezed out. Typically when a company posts earnings results as strong as General Motors' were this past quarter, Wall Street will reward that company with a valuation that is better than a paltry enterprise value to EBITDA of 5.3 times. Yet that is where we find shares of GM today, and that means the company has a juicy looking current dividend at 4.8%. What has investors spooked, though, is that auto sales in the U.S. may have peaked recently. 2015 was a banner year for the industry, and executives at GM and Ford Motors seem to be hinting that they are prepping for a decline with statements about maintaining dividends and positive earnings as they have lowered their cost structures enough to handle weakening sales. This makes for an interesting quandary for investors. Do you jump on shares today when the stock is cheap by traditional valuation metrics? Or do you possibly hold out for a little further down the road as shares will likely take a hit as the industry enters a downcycle? I don't think I would shame anyone for picking up shares today because its stock does appear to be a decent value. Chances are, though, those with a little more patience could wait a while to see how these stocks react to declining sales.